I HEARD a much respected man express his deep sadness and apprehension at the present state of affairs in Philippine society, saying that this moment is the worst and most dangerous he has monitored in the past 60 years. Privileged by circumstance to have had access to strategic personalities and events from his youthful days, Professor Manuel Quiazon Yap is one of a few left in the country who has experienced firsthand national and international political dynamics either as participant or witness. When he says that we are now inside the eye of the storm, at the edge of our most precipitous political cliff, it is wise to listen and reflect on his insight. For centuries, the Filipino has been unable to resolve layers of human contradictions ushered in by colonialism. A free and deeply spiritual people were thrust abruptly and violently into a situation they had not deserved -- conquest by aliens with the most contrary customs and cultures. In seamless transitions, Filipinos were subjugated by Spaniards, Americans and Japanese, in times that saw the horrible massacre of natives who were unwilling to lose their freedom and their traditions. Trauma after trauma forced a coping mechanism in the Filipino psyche that morphed from one perverted form to another -- all for the need to survive. Jose Rizal saw this phenomenon more than a century ago and described it sensitively in his essay, "Indolence of the Filipino." He had dreamed of intervening, of perhaps reversing this ugly process of how natives are dehumanized by the greed and lust of nations for power. 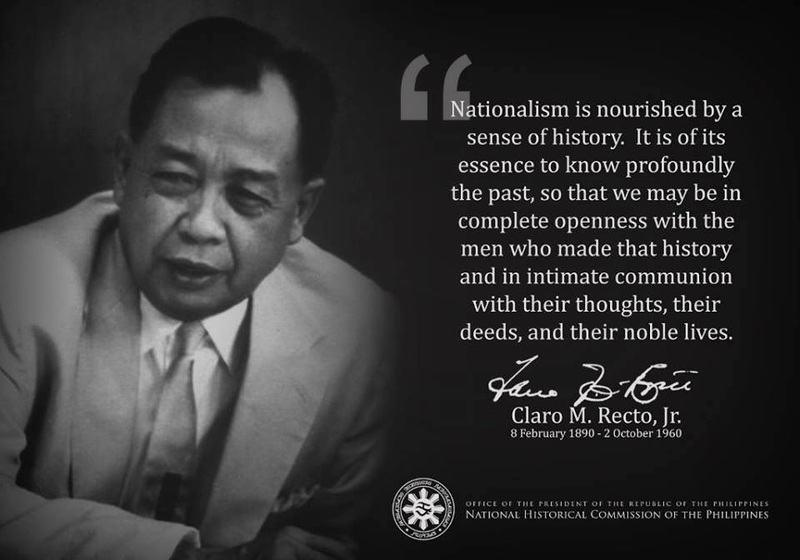 The colonization of the Filipino and the Philippines is a classic example of the exploitation of man by man, of nations by nations. The fact that the world had to undergo that phase of global history does not make our colonization less ugly, or less painful. Worse, the fact that we have forgotten so many critical aspects of our historical truth and cannot learn from them continues to haunt us mercilessly today. As the culture of ages stretched and bent over to accommodate imposed foreign dictates, often in a bloody context, the Filipino did survive but is now lost in a maze of natural and forced influences that defy coherent description and understanding. The composite of what the Filipino is today is best encapsulated in the term, psychological disaster, the most dominant feature of which is an inculcated predisposition to fight one another over any issue. The divide-and-rule culture of foreign masters, after 400 years of application or enforcement in Philippine society, succeeded in twisting the gracefulness of what was naturally evolved into a groveling, grasping and quarrelsome present day mutant. It is, indeed, a blessing that glimpses of the past can be captured in many rural areas that have largely been left alone due to difficulty of access. Many Filipinos in those areas are much more friendly and honest, a miraculously lingering expression of what naturally was. But sadly, they are a dying breed whose demise is facilitated by the unstoppable march of technology, especially in the field of communications. It is not only new knowledge that is brought by tri- and multi-media, it is also unwanted cultural indoctrination. What is sad is that we are living in a nightmare that we think is par for the course, a norm we think is as natural as the light of day. The truism that we cannot live in the past should apply at all times, but a living nightmare IS living in the past. It is only when we awaken from it that we can begin to live in the present. We have to transcend the curse it has cast on us -- the warped and perverted mindset that dictates our present collective behavior. Our collective predisposition to fight and destroy one another has finally brought us to a logical consequence. We have arrived at a constricting quagmire that can only conclude in violent confrontation, maybe even a class war. The masses are not wanting in pain and anger, just the charisma of a leader whom they will follow. The cause is already there in the face of massive poverty and corruption. The alternative ideologies, however, that have been offered, the names and faces presented, have not excited or inspired a suffering majority enough to bring them to physical action. As though our internal problems are not enough, as though our predisposition to fight and destroy one another is not enough, the motherland is additionally influenced towards more tension as America the superpower is challenged by China the superpower-to-be. In our region, it is the Philippines that will feel the most heat from an inevitable contest between two giants. Already, China through Chinese-Filipino or Chinese businessmen controls the economy. The United States, on the other hand, continues to control our politics and our military. Between a rock and a hard place is one way to describe our present position. Yet, most Filipinos do not even realize the global and regional dynamics that dictate on our national and international policies. A people and country so utterly dependent on the loans, investments and products of others are so weak that real and functional freedom and independence remain elusive. The desired self-reliance that is a people’s foundation for a strong nation still has to be built against all odds and the state of historical amnesia. The only way to avoid a terrible process of self-destruction as a people and nation is to wake up from our stupor and learn the lessons that our colonial past has to offer. We have to understand the extent of our incapability to take care of ourselves and our shameful need to cling to everybody’s strength but our own. It is not to stoke resentment at all those who brutalized our forefathers that the historical truth must be known and understood; rather, it is to teach us how to relate to those who have control of our destiny until they let go and allow us to evolve at our own pace, in our own way, and towards a tomorrow we will be proud to leave as legacy to the next generations. Exploitation of man by man, of nation by nation -- this is the nightmare that has visited us and, to a large extent, has influenced us so strongly to be the unsuspecting puppets that we are. We must awaken, sweep the cobwebs from our minds, reach deeply for a lost history, understand why we are what we are today, and build our tomorrow today.